I have little time in my life for television these days, which I suppose is a good thing. I would like to catch up on some essential viewing – the Sopranos, Six Feet Under, 24, Extras, Arrested Development – but otherwise I don’t really miss it.Who watches all these programs, anyway? King of Queens just began its ninth season. Is there anyone reading this who has watched that show? What about Las Vegas, According to Jim, Men in Trees, Wife Swap, Stacked, Vanished? Any fans?I think most couples do have at least one personal favourite that might strike others as quirky. For example, one of my friends was a fan of The Bernie Mac Show, something I never got around to watching. Another couple recently revealed they watch Dog The Bounty Hunter. Chacun son gout. 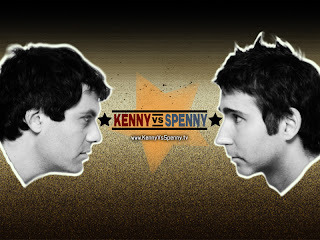 Our guilty pleasure is Kenny vs. Spenny. It’s juvenile, and sometimes gross, but we think it’s really funny. Plus, it’s a Canadian success story, so we’re doing our part to support the industry. Seasons 1 and 2 are on DVD for about $22 each, or you can check it out on Showcase on Thursdays at 9:30 pm or Saturdays at 9:00 pm.So, anyone else have a guilty TV pleasure that they want to confess? I’m embarassed to admit it for many reasons. As I was writing this post, Bronwen was watching SYTYCD Season 2 on MuchMusic. You and her should compare notes on Benji and Heidi (she of the freakishly large forehead). Reruns of 90120. I’m still hooked! Does Dylan love Kelly or Brenda? Great stuff. Benji stole it from Travis. I want a re-count.